Camping cabins in wooded areas with porches and cable TV. Cottages with electricity, cable TV and front porch. On site Motel rooms with cedar log furniture and Adirondack decor. Be aware that there seems to be no security here after 10 pm. Feel very unsafe due to next door neighbors watching television outside around the campfire until 2 am.Not really appreciating leaving the noise of the city to listen to neighbors movies laced with profanities while sitting around the campfire trying to enjoy nature. We are very sorry to hear that you felt unsafe while here! We are a family owned campground... with 6 family members who live on the property and are ready to respond 24 hours a day to any need. We have property-wide security on duty and enforce our quiet hours, We do have staff that patrol the campground late into the night. We will respond to any call at any time... and we wish you would have made a call to let us know there was a problem so that we could have ended it immediately. We apologize for you experience and hope you will give us another chance. Clean, older park but well maintained. Staff friendly and helpful. There are two areas to this park, one side called the resort area and another area on the other side of the road called The 100 Acre Woods. The resort area is more your typical RV park with RV sites, tents and some cabins. Sites are close together and packed dirt/gravel, but well maintained. Internet was spotty, but we did get reception for our Verizon hotspot. We also got satellite reception at Site 12. Road in is so narrow that we had to move our car at least 6 times in order for other campers to back into their sites. The 100 Acre Woods area is heavily wooded and more like a state park type campground. Park is located close to hiking and all the Olympic venues at Lake Placid. Quaint little gem in the Adirondacks of NY State, 2 miles from the Whiteface Ski center. We stayed here for 3 nights as it was close to an event my family attended. Facility was cute, capitalizing on the Christmas theme and the sites are well laid out, with a fire ring area in back of each site with some distance between your rig. Prices are very reasonable, the General Store had many items and the bathrooms were very well maintained. The grounds are nice (but tight given the area) and many of the facilities are aged and worn (has the old and falling apart feel....but with fresh paint for the cameras). We are a family of four that has traveled all over the country/world and I can honestly say that the staff is the most unfriendly and unaccomadating we've ever seen (2 years in a row!). So why did we stay here again you ask....the area fully books out during Ironman and they are all that's left! They were so rude this year, we've decided to boondock next year if we have to. Other than one older gentlemen who was always kind, the rest of the staff made us constantly feel like we were an inconvenience to them. We would not recommend this campground to anyone and we will not be back. Good Sam should send someone unannounced to camp here and then relook at making this a Good Sam park....my guess is they would remove their sign out front. We live so close but never realized what an amazing campground this was. We loved the pool and being able to walk to the Wilmington beach. The sites were roomy and the 2 sites we had were private. As a Sam goody member we even saved 10%. The restrooms were clean and the showers were better then most camp grounds we have been too. Friendly family run facility! Absolutely the cleanest bathrooms I've experienced anywhere!! Exceptional camp store. Close to Ausable River for fishing, Lake Placid for shopping, Hungry Trout for dinner, 2 excellent fly shops within a mile. Level immaculately groomed sites, we'll be back! We love fall RVing. We came here for one weekend a few years back and loved it so much, we come for 3-4 weekends every year since. So much to do in the area. Great family place. We only live 150 miles from this campground and it is our favorite getaway place to camp. We love the 100-acre woods section, with long private pull-thru sites. The guys who guide you in are top-notch and the sites are raked with firepits emptied before your arrival. The feel is very woodsy in Adirondack Mts. It is a 20-minute ride to the beautiful Olympic village of Lake Placid. This place is fantastic. Friendly owners and staff. Sandwiched between a lake and the mountains. Hiking accessible from the property. Ice cream and burger places both next door, and across the street. Bathrooms nearly spotless, even the floors. spacious sites, many with extra picnic table in the woods for shade. Liquor store right there, Chocolate store on the corner. Grocery store within walking distance. They have it all. 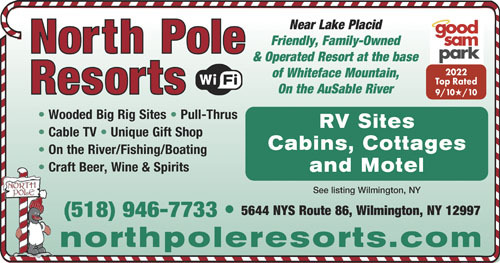 North Pole RV Resorts offers some of the best non-RVing accommodations in the area. 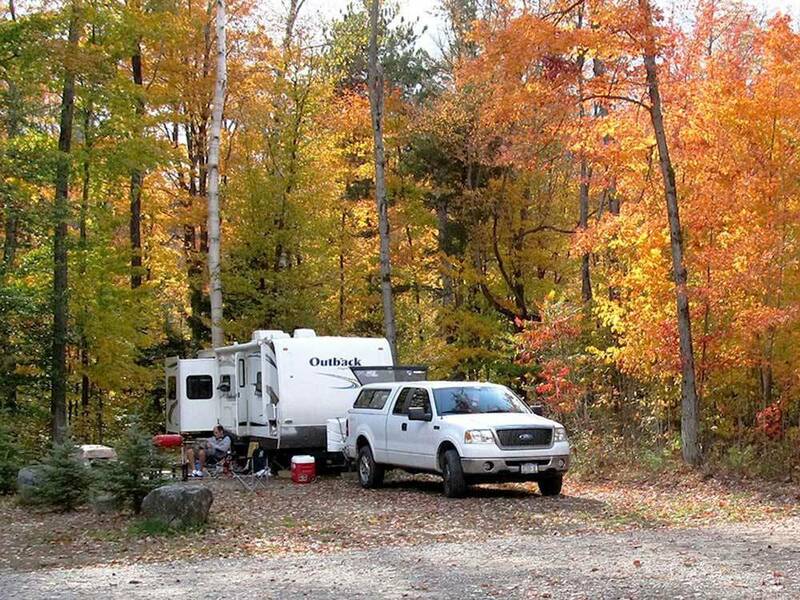 You can enjoy all the RV park's activities & the Lake Placid area attractions. Make your reservation today & start enjoying this lifestyle!